I’ve kind of left all of you hanging here for a while! I’ve been busy out of town for weddings, family visits, and a funeral – cooking and visiting, planting my sister’s garden, playing with my nephews and nieces. At home again, it’s that late Spring/early Summer season of long days, cool nights, thunderstorms. I’ve climbed out onto the fire escape to enjoy the view of the wisteria in bloom across the back yard a couple of times. I’ts a nice place to sit with a cool drink while I wait for something to finish cooking. 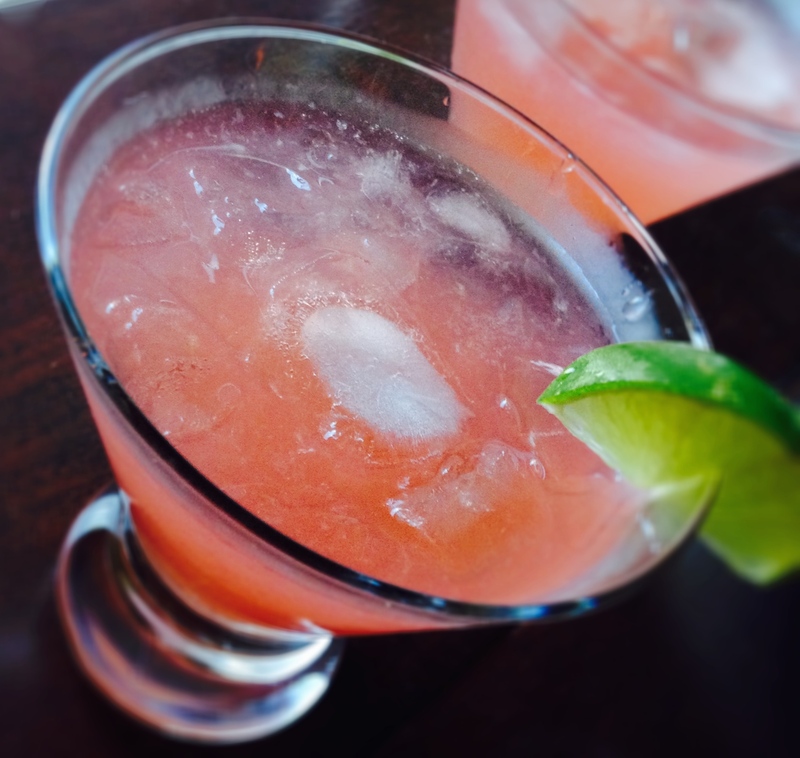 This drink is a little pink spin on my ideal margarita recipe – tart and limey and mildly sweet. The rhubarb syrup just works so well and it’s just a pretty drink. You can replace the syrup with lime juice for a more traditional margarita which is also pretty awesome on a warm summer afternoon. Mix the lime juice, rhubarb syrup, triple sec, and tequila. Pour over ice in a shaker or glass jar. Shake to combine and chill. Pour over crushed ice in glasses and serve with a lime wedge (in case you like it a little tarter). Bring to a boil, reduce the heat, and simmer for 20 minutes over low heat until the rhubarb is soft and the syrup is infused with pink color. Strain the rhubarb pulp (save the pulp to mix with yogurt) and store the syrup in the refrigerator for a couple of weeks.